Earlier this year, I saw a girl at Wallpaper (a neighbouring magazine to InStyle in my office building) wearing a pair of amazing white leather trainers with a really interesting three-way split sole. ‘Those are AMAZING’, I said. 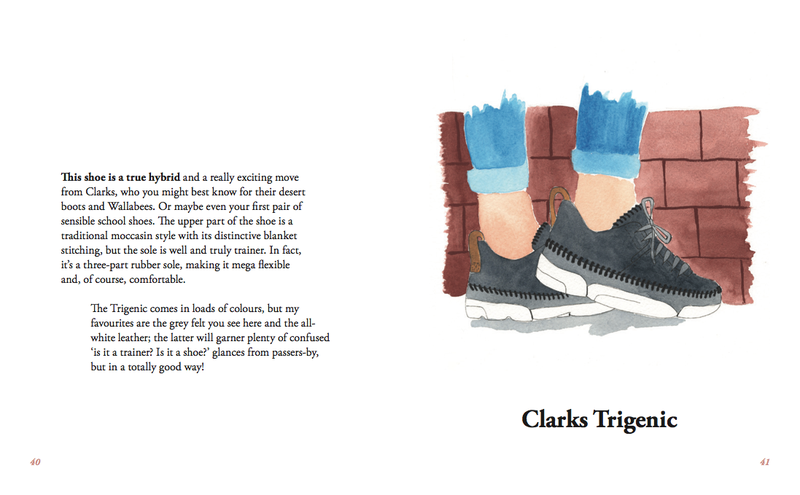 ‘They’re from Clarks’, she replied. I’m not going to lie, I felt like quite the fool for not already knowing this. I love Clarks Originals, but somehow I had managed to miss these when I’d looked at the new season a couple of months earlier. So off a went to get a pair for myself but alas, they had sold out EVERYWHERE. 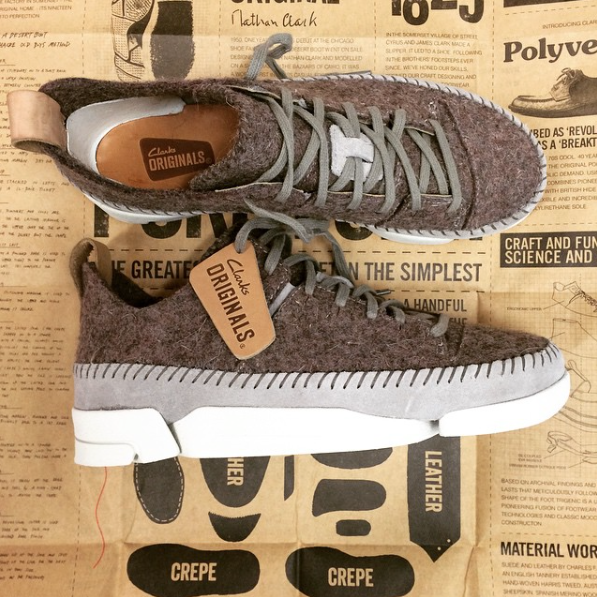 I even roped the Clarks press office in to help me but they couldn’t get hold of any either…so they promised me that as soon as the new season styles were available, they’d get some on my feet. I was absolutely certain I would fall head over heels in love with these trainers, so I included them in my new book – En Brogue: The Trainers Guide – despite the fact that I still hadn’t been able to get hold of a pair (see below). But it was a risk that paid off because when my grey wool pair of Trigenics arrived a few months ago, I was totally smitten. I love the woolly grey fabric even more than the white leather on the ones I had been lusting after all those months ago. And, unsurprisingly for Clarks Originals, they are REALLY comfortable. I’d go as far as to say I think they are THE most comfortable pair of shoes I own. I know, that’s quite a statement, right? I’ve held off on doing this blog post because I was waiting for Clarks to get them in stock in lots of sizes, but the grey ones are only available for men at the moment. You can get a pair of grey spotty ones though, if a slightly more feminine look is for you. 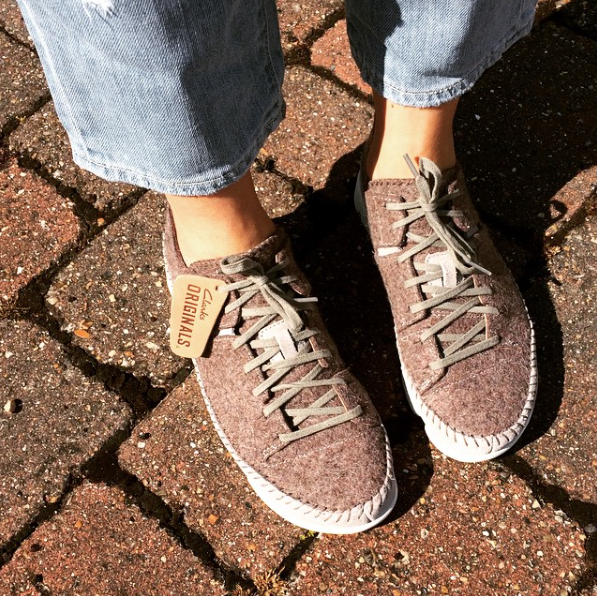 The good news, though, is that the Natural Shoe Store has my grey Trigenics in stock in ladies’ sizes right now, though they are low on stock so don’t mess about if you want a pair for yourself. I really can’t recommend them enough! They come up a little small – for me I wear my regular size 4 but if you go up 1/2 a size in Clarks Originals desert boots I would suggest doing the same with these.